Patsy and I chose 2 recipes for her to make. She has been wanting to cook more. When she was younger, we would have weekly “cooking lessons.” So, we’ve decided to start up a more organized system so she can get in more time cooking. She wants to do the 4-H fair this year, so needs to work on her skills. 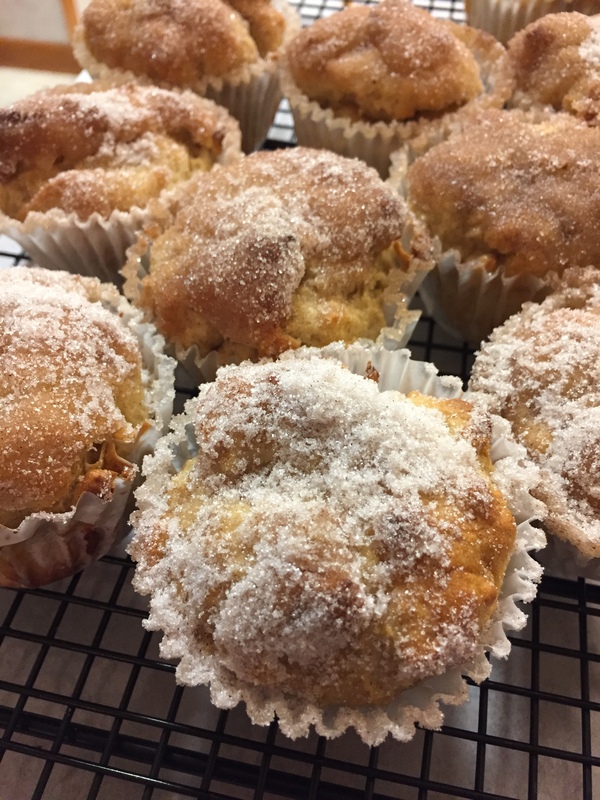 The first recipe was applesauce muffins, with a cinnamon-sugar topping. They were delicious. To me, they tasted like donuts! Yum:). We are going to try them again with a different gluten-free biscuit mix. The one we had was pretty strong, because of the kinds of flour in it, and the muffins were quite dense. I want to try a lighter one. Sometimes, when you convert recipes, you have to experiment a bit. They weren’t bad, though. They quickly vanished. 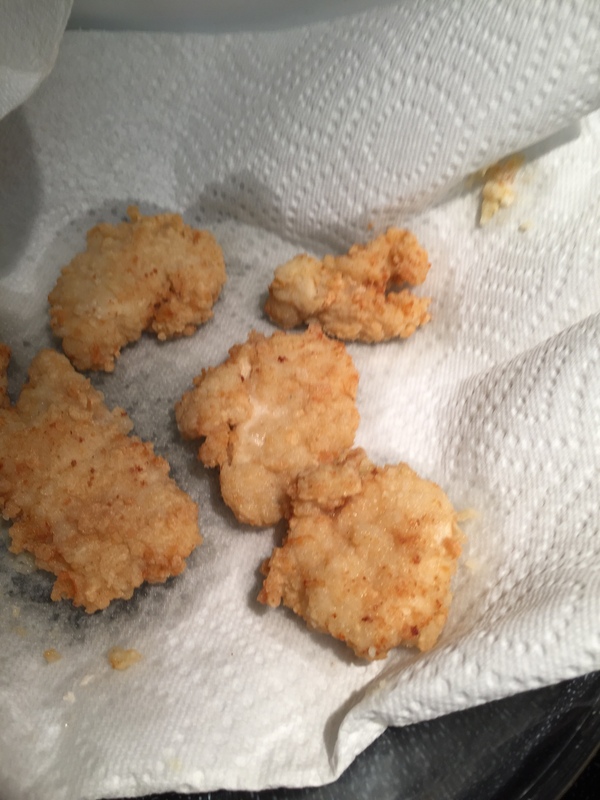 The second recipe was chicken fingers. It was coated with buttermilk and egg, then fried in oil. Boy was it good. We won’t be making this one very often, though, as we don’t care to eat much fried food, and it was quite expensive after we used gluten-free bread crumbs as part of the coating, and it used a lot of oil. The taste….yum, yum, yum! 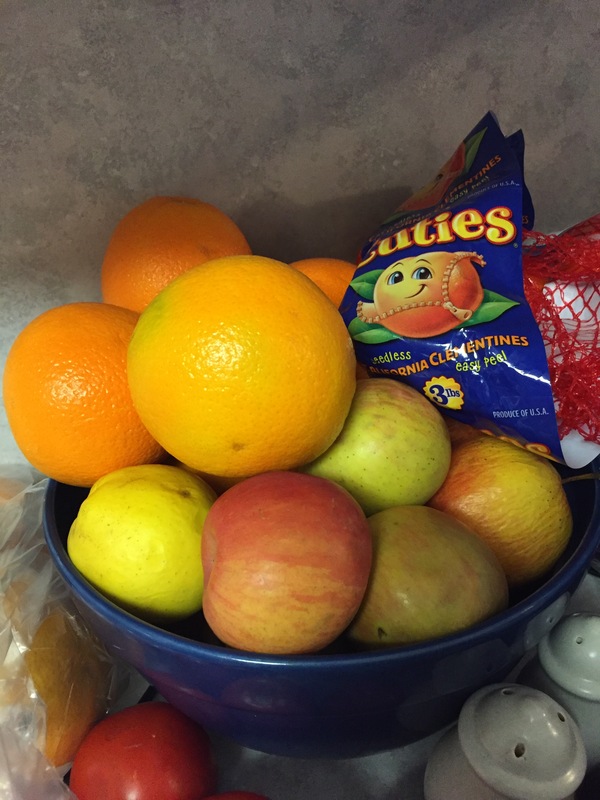 We continued eating fruits and vegetables that I bought last weekend. We’ve had a house full of sick ones, and they are recovering nicely now, but I loaded up on citrus and other fruits and veggies for them, and for the rest of us so we would stay well. We also ate home-canned and frozen items, as well. I made smoothies from peaches–I used both frozen, and the juice from a jar of canned peaches. Some of the apples look a little wrinkled. I think I will make something from them this weekend! We are having a smaller family Sunday dinner this week, at our house, and I want to serve snacky Super Bowl-type foods. Maybe some apple bar cookies…mini muffins….not sure yet. I’m still working on the 10 pound bag of carrots I got from Costco a while back. 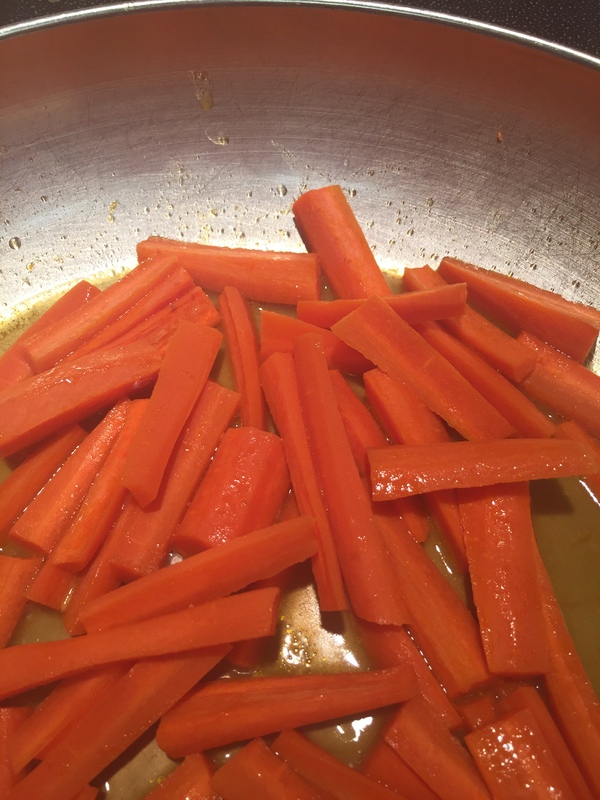 This week, I made orange-glazed carrots. Part of my shopping last week for the sickies was orange juice, so I just used some of that in the pan when I cooked them. I basically stir-fried them and they were still pretty crunchy when we ate them. They were good. My niece, Alissa, made another big pot of cheesy potato soup. It’s her favorite soup of all time, and she makes it often. We still have a bunch in the fridge. I had made a large pot of simple chicken-rice last weekend, and it was finished up early in the week. I had fried up a bunch of taco meat last weekend before we realized that none of our company was coming. So, people have been sprinkling that on taco salads, or making soft-shelled tacos, or nachos, or whatever they wanted all week long, since we had large quantities of all the ingredients on hand. How did your meals turn out this week? Good for little Patsy to want to learn more about cooking. My daughter always loved to cook when she was Patsy’s age but my son not so much. I kept telling him that one day he would be on his own and have to eat the same thing every day if he didn’t learn a few meal items. I think at the time he thought a person could live on McDonalds. But he did learn and now has to cook for himself and the Grand Girls. Guess that little bit of time spent in the kitchen while he was young might have made him more comfortable as the family cook he is now. Those muffins look delicious. I had to go and grab 2 sugar cookies after seeing them. 😉 Carrots in orange juice glaze are one of the few ways I actually enjoy cooked carrots. Yum! We don’t do a lot of fried foods that use a lot of oil either, but that chicken looks good, too. I have to confess, it tasted SO good:). I ate way too much. The muffins look great. I think its wonderful that Pasty is cooking. All of mine like to cook. It’s good for them to learn. When my daughter was away at college she cooked for her friends all the time. Some of them couldn’t even cook any egg. Ha, ha, I am another person who had to go in search of a cookie (after thinking about making some muffins or cake, myself) after seeing those muffins! 😀 The cookie was easier than baking muffins! That’s not all! I pulled out a package of roast chicken bits and pieces (including the bony parts) from the freezer and I have it simmering in a pot with some water, right now! I will add some carrots and celery, etc. to it to make some chicken soup, for the week! Thank you for the meal planning inspirations! Last week, I ate from the freezer and pantry. Looks like it will continue this week, too! Hope everyone is feeling better after the illnesses, last week. Thank you. People are feeling much. better this week. Our oldest daughter and her wonderful husband were able to come for dinner tonight, and so things are perking up around here. I’m glad you are getting some ideas for meals!